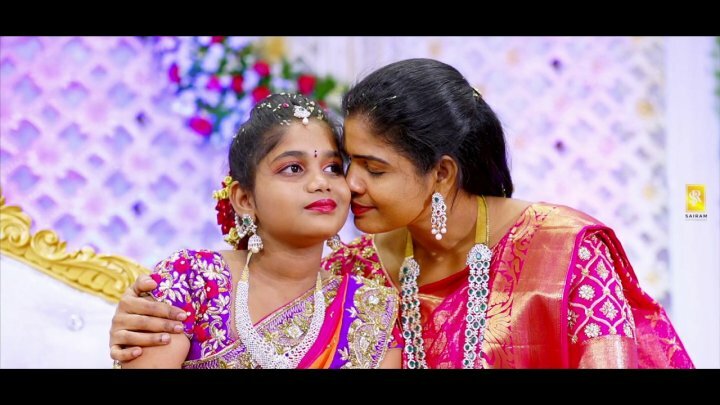 Whether you observe the age old traditions surrounding the half saree function or have a modern view of this ancient custom, this is one of the big landmarks in a young girl's life, and even as guests and family pour in to shower her with blessings, send them home with great return gifts. Read on to find some super return gifts for ladies, ideal for a half saree function. India is a land of numerous beautiful and peaceful festivals. We Indians celebrate every important occasion in our life in some meaningful way. And, among the numerous colorful Indian rituals and religious practices, one of the uniquely rituals we have is a half saree function. Half saree function is a very heartwarming and female empowered ritual. This function is connected with the development cycle of the female body. Half saree function isn’t very popular in the northern and eastern parts of India. That’s why not everyone is familiar with this function. So, if you are not familiar with the half saree function properly, then let’s take a look at what a half saree function is all about. 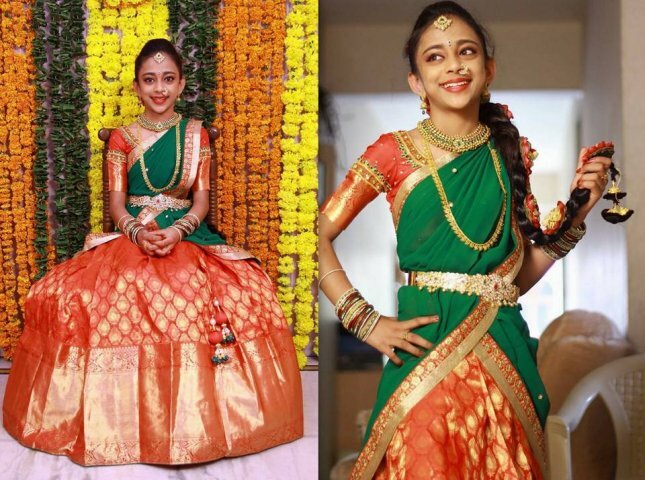 Half saree function or Langa Voni in Telugu or Pavadai Dhavani in Tamil or Langa Davani in Kannada. 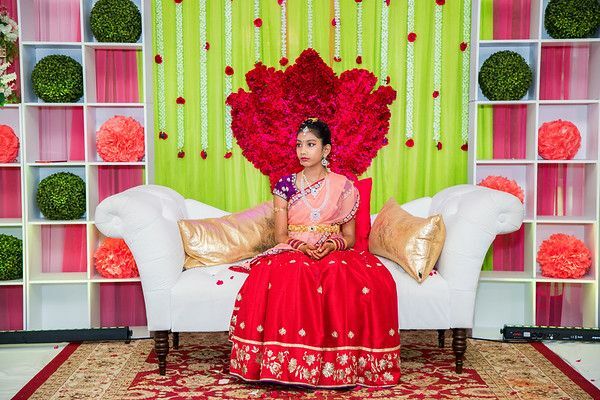 In South India, the Ritu Kala Samsara ceremony or Ritushuddhi is celebrated to welcome the young girl into adulthood. When a girl passes the stage of the first period, then the half saree function is celebrated. 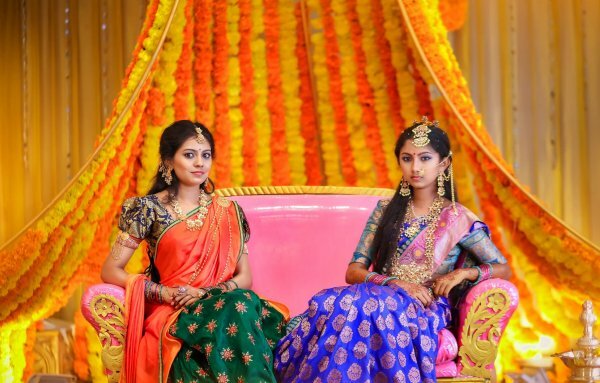 In this function, after the passage of the first period of a girl all her friends and ladies in the family gather and dress her up in a half saree for the very first time. Half saree function was traditionally celebrated just after the first menstrual cycle of the girl. It was a time when all the females of the family wore a half saree for the first time as a young girl; they would continue to wear half sarees up to the time they got married, after which her half saree would be converted into a full saree. But, nowadays this half saree function is replaced by the half saree party. Where all the females come in their best party attire and celebrate the coming of age of a young girl. They give gifts to the girl, and in return, the family of the girl gave return gifts to them. So, with the passage of time method of celebrating half saree function has changed, but the spirit of the function is still there. Half saree functions are mainly performed by South Indian Hindu families. The whole process of the half saree function is very beautiful and feminine. This ritual is performed when the girl is at the age of 9, 11 or 13, basically, the girl has to be an odd number of age. In the first phase of the ceremony, the girl wears the Langa Voni given by her maternal grandparents which then will be replaced by the half saree given by her paternal grandparents. So, overall this function is a very beautiful way to celebrate the entrance of the young girl into womanhood. The half saree function is a very popular and important function in south India. So, the celebration of the half saree function has to be very grand. 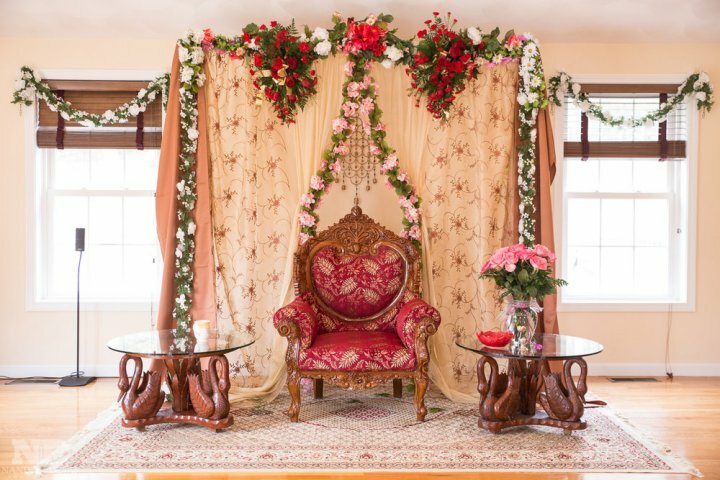 Every part of the function has to be very feminine and beautiful. Half saree function involves lots of gifts, partying and dancing. 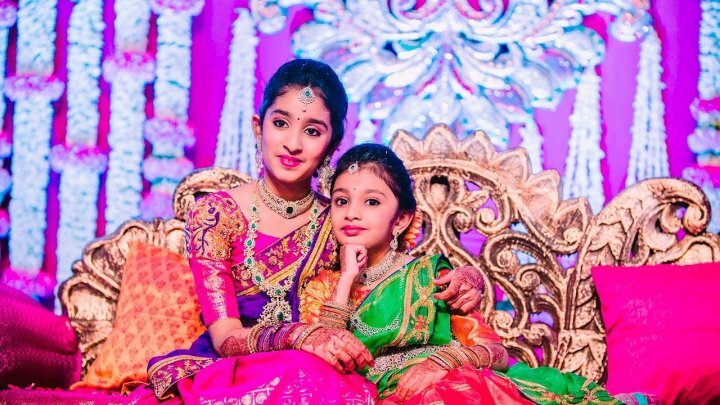 To celebrate a grand half saree function of your little girl, you have to think about the following things. The first and foremost thing that you should consider in planning the half saree function is the venue. The venue for the function has to be spacious and easy to locate. The venue can be your own home if you are keeping the function low key, but if you have invited more than a hundred guests then your home may not be spacious enough for the function. Holding the half saree function in an open space is a good idea, but for a night function you can select a hall or banquet. You can also select the venue on the basis of your theme for the party. Whatever you choose, don’t forget to decorate your venue with some fresh flowers and twinkling lights to create the perfect backdrop for your girl's big day. The next important thing that you have to do is to design the half saree function invites. 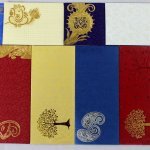 For the invitation ideas, you can check Pinterest as you will get numerous invitation card ideas there. For some personal touch, you can design an invitation card according to your theme. The most trending invitation card ideas these days are digital cards. Digital cards look more creative and unique as compared to the traditional cards. And, moreover, with digital cards, you can contribute towards saving the environment. However if your preference is for traditional cards, there are plenty of creative card ideas available in the market; if your budget allows it, have a card designed specially for the event. To make your half saree function the talk of the town, you have to give some remarkable return gifts to the ladies who are attending your function. 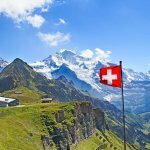 The return gifts have to be meaningful and impressive, but still, you need to stay within your budget. The return gift ideas for the half saree function can be something traditional as well as trendy. The return gift has to be related to the theme of the party. Moreover, the return gifts will make your friends and family happy and happy guests are equal to the successful function. And, guys buying affordable return gifts is a very easy thing, you can easily order return gifts online in the bulk. Remember the event will be attended by ladies of different ages as well as younger girls and kids, so buy gifts that all can appreciate. Okay, so if in the planning of the half saree function, you didn’t get time to pick out the return gifts for ladies. Then, don’t stress out as now you can easily order return gifts online from the numerous traditional websites at very affordable rates. Moreover, you can select the return gifts from the wide variety of the goods. Even online, you can order products in bulk quantity. So, guys, you can select numerous half saree function return gifts from the wide online market, but if you want to buy something quick, then you can buy following return gifts. 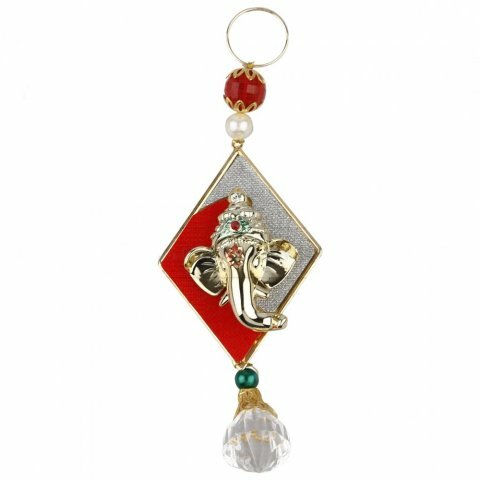 With this cute Ganesh keychain, you can thank all the ladies for attending your little girl’s half saree function and blessing her. This return gift will bring the prosperity and happiness into the life of your guests. Moreover, this beads and stones studded Ganesh ji’s keychain looks very pretty. Your guests can use this keychain for their car or home keys and always remember your daughter. The physical measurement of the keychain are 4cm x 15cm, weighs around 25gm. 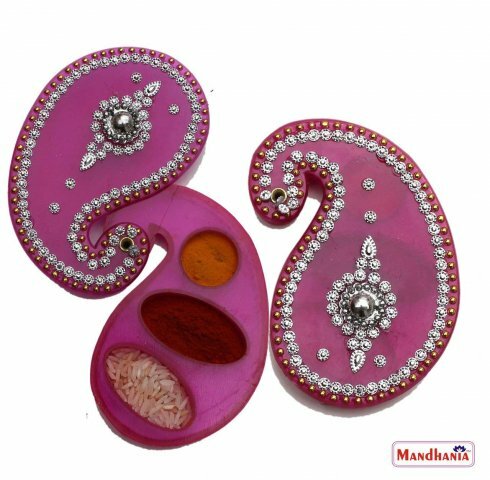 This return gift for ladies can be ordered online in mere Rs.99 from nandigifts.com. 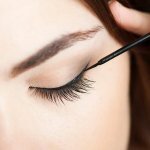 If you are searching for the ideal return gift for ladies, then buy them something useful. Something like this antique golden bangle box in which they can store all their spare bangles. 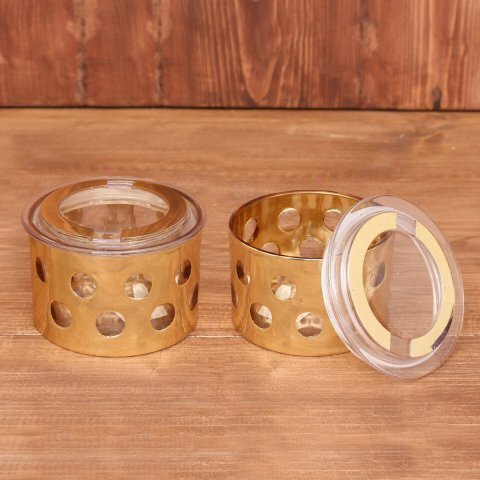 Ladies can store their bangles in this golden antique box and save bangles from getting damage. This utility return gift idea will be highly appreciated by the ladies. This royal looking golden bangles box is available for only Rs.200, which is a very reasonable rate. You can order this return gift online from snapdeal.com easily. 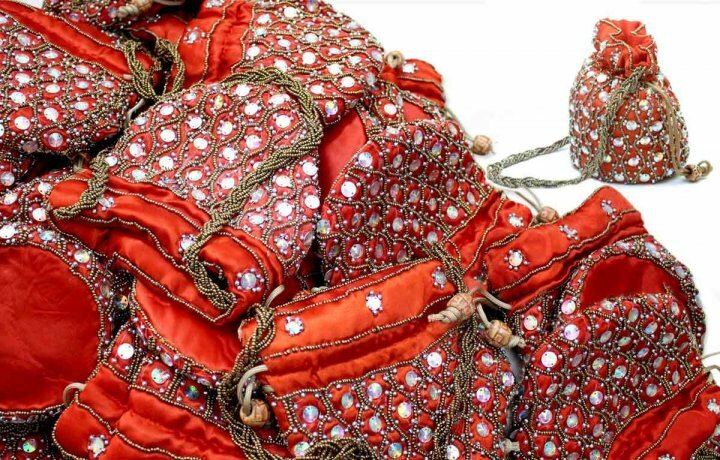 These silver plated lamps with kundan decoration on foam base are a stunning return gift ideas. As every woman like to decorate her home with new colorful things, this set of gorgeous looking floating lamps can be that new thing. Your guests can decorate their home with these lamps, moreover, lamps give the message of prosperity and happiness. So, give these floating lamps as your half saree function return gift and flood the life of your guests with light. These lamps are available on nandigifts.com for Rs.140 each. This return gift item stood both in utility and decorative gift items. The apple dry fruit box is very useful in serving or storing dry fruits in it. 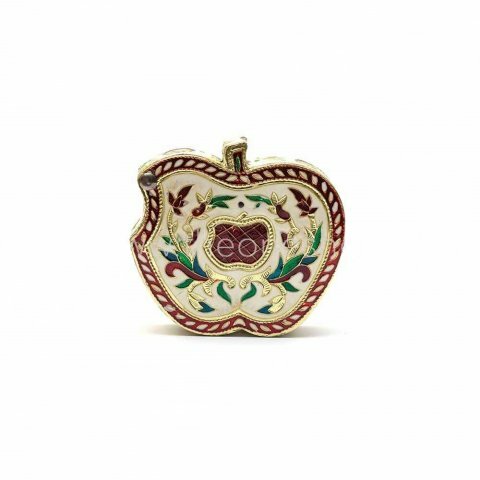 Plus the beautiful meenakari work engraved on the apple shaped dry fruit box makes it look stylish. So, this return gift idea is going to be useful as well as a beautiful gift option. The apple dry fruit box is made up of wood, so it is very durable. It has two different sections where two different types of dry fruits can be kept. This unique apple dry fruit box is sold on theoneshop.com for Rs.165 only. 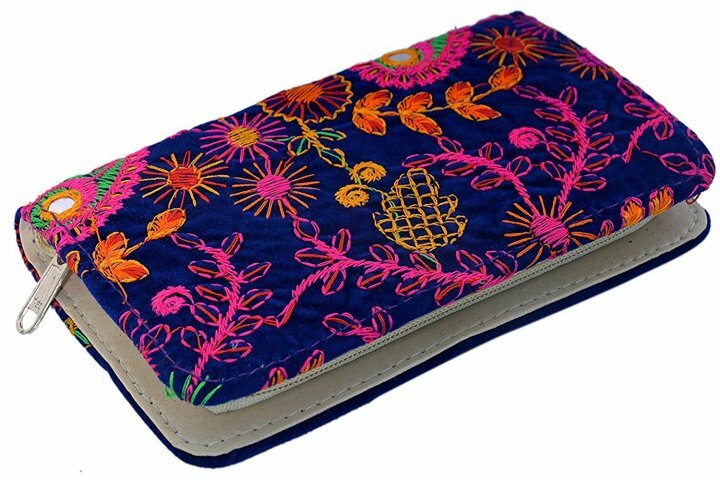 Nothing can be more useful return gift for ladies, then a designer embroidered clutch. The stunning blue and magenta colored mini clutch can be given as the return gift to the ladies who will attend your daughters half saree function. Because ladies always want a small clutch to carry their phones, money and other important things. Trust us, you will become a favorite host by giving this embroidered clutch to the guests. This gorgeously crafted clutch is a bit expensive as compared to other return gift ideas, but sometimes we have to ignore money factor. 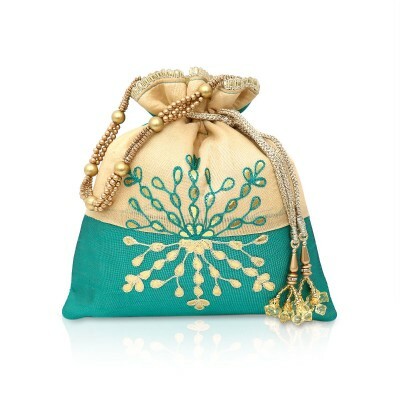 But, still, this clutch can be ordered from amazon.in for Rs.385. For traditional return gift ideas, you can pick this haldi kumkum box for your guests. 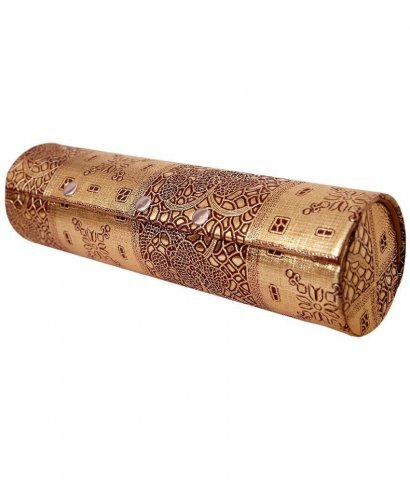 This beautiful hand-carved haldi kumkum box is a useful return gift for ladies who are spiritual. Moreover, the exquisite bead and mirror work design are engraved on the box, so the box can be used as a decoration item also. The particular product is available in a pair of two on Amazon India for Rs.199. The gift wrapping option of the product is also available on Amazon. Multipurpose containers make an excellent return gift for half saree function. These also comes with an airtight transparent lid which will seal the freshness of dry fruits or groceries and also prevent leakage of liquids. The capacity of this container is around 230 grams. That would be quite a useful return gift for ladies as they can store numerous stuff in it. You can minimum order 25 containers from webtree.com. A single container costs around Rs.195, so the deal of the multipurpose container with lid is quite decent. This magnificent meenakari thali with the exquisite peacock design is utterly a fantastic half saree function return gift. 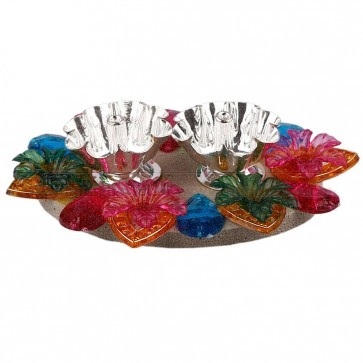 This 12-inch long log-shaped tray can be used to serve dry fruits, snacks, and numerous other edible items to the guests. 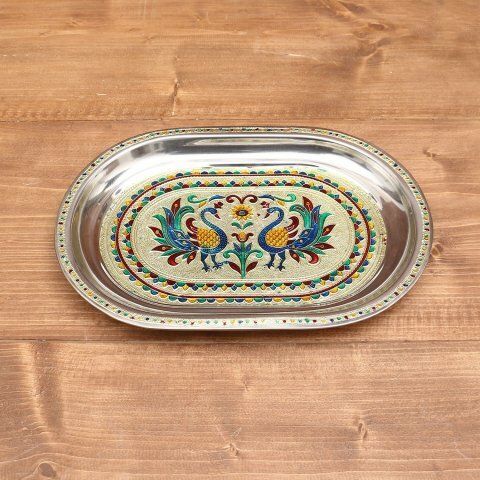 Even if you like you can use this tray to decorate your living room. The tray has the base of the regular steel which makes it easy to use and wash. This tray can order online from webtree.com for Rs.190 each and the website will only accept a minimum order for 10 trays. This spiritual statue of white metal Cow & Krishna with flute under the tree is an ideal return gift for half saree function. This return gift will bless you and your guests with lots of happiness. Your guests can put this white Krishna statue in their home temples or draw rooms to get positive vibes from it. 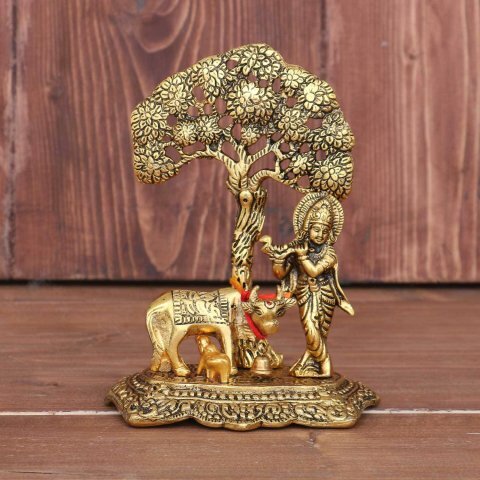 This serene statue is available on webtree.in for Rs.442. This is a bit expensive return gift idea as compared to the rest but, if you order in bulk from the site, then you may get some extra discount. Well, the yet another useful return gift for ladies is going to be a mobile holder. As in Indian traditional dresses like sarees or salwar suits do not have pockets, it becomes very difficult for ladies to carry their mobile phones with them. So, with the Kalamkari mobile holder, you are solving a major problem faced by women. 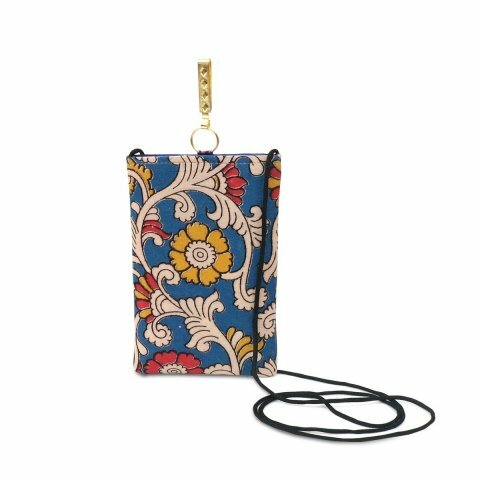 Moreover, the gorgeous Kalamkari mobile holders are not at all expensive. You can order this return gift online from webtree.in for Rs.110 only. 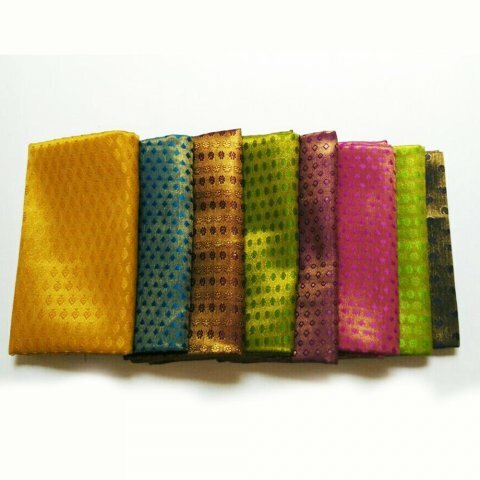 If you are looking for the ideal return gift idea for half saree function, or a gift item you must include in a return gift bag that goes with the ladies of all age, then, we will recommend you to give saree blouses as your return gift. First of all, it totally goes with the nature of the event and secondly, every Indian lady needs spare blouse pieces. So, for half saree function return gift order multicolor saree blouse pieces from theoneshop.in for a mere Rs.85 per piece. These are such great gifts that no matter what else you give, include this item in the return gift bag. 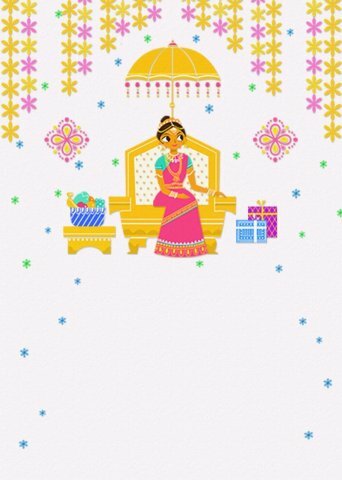 Gift Your Sibling Something Unique on Raksha Bandhan 2019: Choose from Our 12 Recommendations for Brothers and Sisters to Let Them Know How Much You Care!